I love running with Peyton. It's a great way to get her some exercise for the day, while also getting in my workout. I typically take running with me on a day that I can run low mileage and don't really care about my speed. She weighs about 60lbs and can run about 3 or 4 miles, but anything longer than that and she really starts to drag along. I don't run with her often though because she's pretty strong and tends to pull. She also likes to run to the left of me, which really didn't work on the Mount Vernon Trail, which is a shared bike path. When the folks at Dog Fence DIY contacted me about reviewing their hands-free Hipster Jogging Leash, I jumped at the chance. An easier way to run with Peyton? Sure! The Hipster Jogging Leash is designed to provide runners with comfort and safety when working out with their pets. 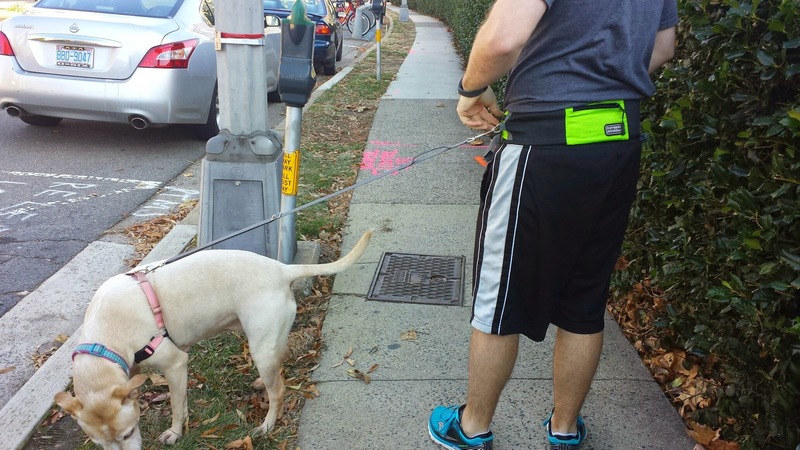 The leash features an elastic waste band with a zippered pocket for your keys and phone. It also has two side pockets that are perfect for carrying small treats and doggie bags. The leash itself is adjustable (up to 6 ft) and has a convenient loop for your hand in the event that you need to pull on the dog. One end clips into the elastic waste band, the other to the dog's leash. The fact that the waste band is elastic is great because when your dog pulls, she's pulling on the elastic, rather than on you. When our leash came in, The Pilot was ecstatic. He runs with Peyton more than I do and jumped at the chance to try it, so he strapped it on and we headed out together for a run with Peyton. In his words: I like the comfort and ease of running without holding a leash. His cons? The leash was too thin. We literally keep Peyton on rope because she's so strong, but if we wanted to, we could easily swap out our leash for the other one. I decided to give the leash a try too and, while it definitely minimizes the pulling, I still felt it more than The Pilot did. I don't think everyone would have the problem though because at 60 lbs, Peyton weighs more than half my body weight! If you decide to try the leash, I highly recommend doing so with your dog on a harness. It's the safest way to run with your dog. Make sure your dog is well trained on a leash, this is a hands free leash after all! As always, when running with your pup, make sure to bring some water along. Dogs get dehydrated too! The Hipster Jogging Leash retails for $29.95, which is super reasonable. Do you run with your dog? 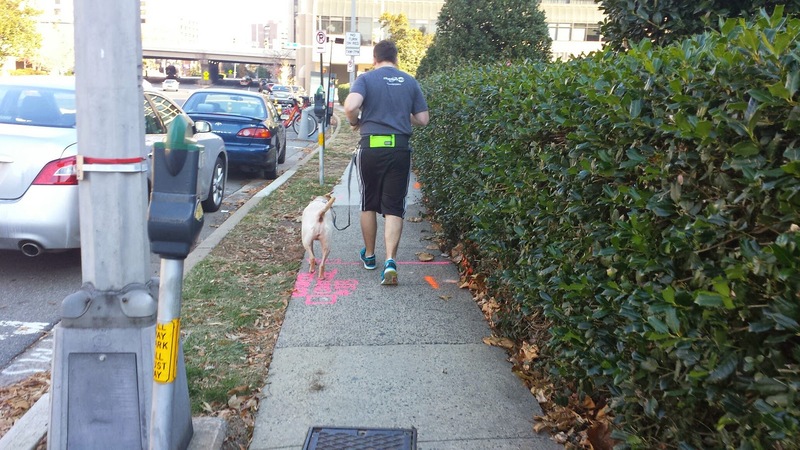 Have you ever tried a hands-free jogging leash? Disclaimer: I received this product complimentary for review purposes. Aside from the product, I have not been compensated for this review. All opinions are my own (and The Pilot's). I was wondering when someone would come out with a hands-free leash. But even though Mochi is only 20-25 pounds we use leashes designed for large dogs because shes crazy strong and is super sneaky, she always tries to chew her leash when we're not looking. I'm really wanting a hands free leash for my pups. They are great for running with, but I hate having something in my hand!